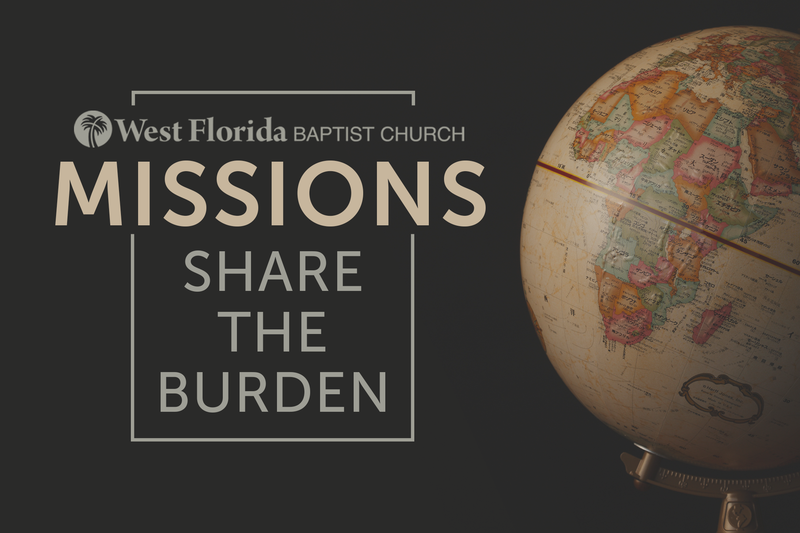 West Florida Baptist Church is committed to fulfilling our Lord's command to spread the gospel of Jesus Christ around the world (Matthew 28:19-20) by supporting the work of faithful missionaries through prayer and financial giving. You can find information below about the missionaries we support, as well as our practice of Faith Promise Giving. Listed below are missionaries supported by WFBC as well as links to recent prayer letters, searchable by region or name. If you would like to receive weekly emails including recent prayer letters of these missionaries, please click here. WFBC practices Faith Promise Giving, an approach taken by the church to fulfill the Great Commission by providing financial support for missionaries. Individuals within the church prayerfully commit to the Lord to give a particular amount for one year towards the missions program of the church, in addition to regular tithes and offerings. Commitments are submitted anonymously and are used by the church to plan missionary support for the upcoming year. If you'd like to make a one-time donation to the missions program of WFBC, click the link below and select "missions".